Stock photo of an unusual angle of the Canwest Place building in the City of Winnipeg, Manitoba, Canada. An unusual angle of the stunning Canwest Place building in the City of Winnipeg, Manitoba, Canada. 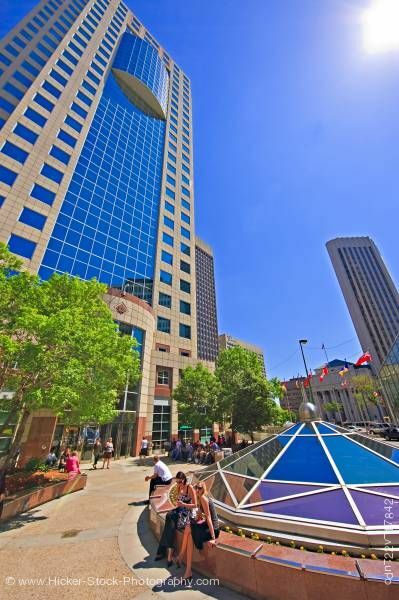 This stock photo shows an unusual angle of the Canwest Place building in the City of Winnipeg, Manitoba, Canada. This stunning building rises high with it's impressive architecture of masonry stone and tinted mirrored glass windows. In front of the building the stone and block walkway shows people enjoying their day. A few trees provides shade for people while they sit along the low granite walls. The foreground has domed window with different panels of colored glass surrounded by a granite wall. A few people are sitting on the wall. Between the wall and the dome are yellow flowers to add to the surroundings. The background shows a few buildings with their own architectural details. In front of the buildings are several colorful flags flying high that lead down the street under a bright blue clear sky.